THE SKINNY: When it comes to eyeliners, you get what you pay for. L’oreal says this eyeliner will take from from “everyday to exotic,” but my experience with it has just been ho-hum. 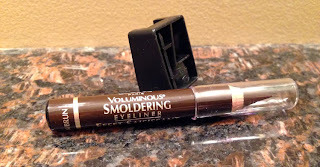 This liner is a little drier than the creamy-but-tough products from brands such as Urban Decay, Clinique and Smashbox. Because of that, it’s harder to blend and doesn’t stay in place as long as the others. L’oreal does give you a sharpener when you buy this liner. But I’d rather pay more for a product that it going to wow me. KEEP OR TOSS: Toss. It just doesn’t measure up to my go-to eyeliners from higher-end brands. CHECK IT OUT: Voluminous Smoldering Liner is available in three colors: Brown, black and gray.